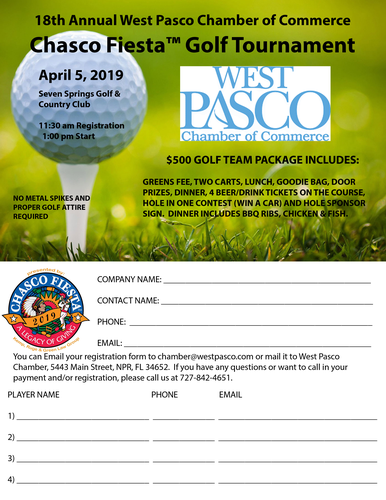 Are you ready for the 18th Annual West Pasco Chamber of Commerce Chasco Fiesta™ Golf Tournament!!!!!! It will be held on April 5th at Seven Springs Golf & Country Club. Registration starts at 11:30 am and Golf starts at 1:00 pm. You get lunch, dinner (Ribs, Chicken & Fish), goodie bag, 4 FOUR beer/drink tickets, a cart and 18 holes of golf. Don't miss this West Pasco tradition! Fill out the flyer and send to the Chamber office or drop it by in person or scan it and email it to us. You can pay over the phone with your credit card.